Bernie Sanders-Hillary Clinton: Vermont Sen. Sanders reportedly will launch bid for Democratic nomination Thursday, giving front-runner Clinton her first official challenge. 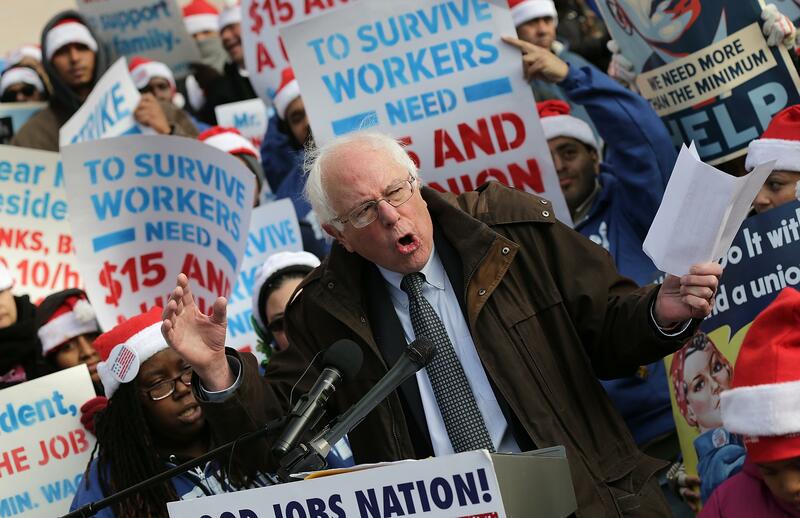 U.S. Sen. Bernie Sanders (I-VT) speaks to low-wage federal contract workers during a protest where the workers demanded presidential action to win an increase to $15 an hour wage December 4, 2014 in Washington, D.C.
Hillary Clinton is about to get her first official challenger from the left. Sen. Bernie Sanders plans to formally announce his presidential campaign on Thursday, according to a report from Vermont Public Radio that was quickly confirmed by a number of other outlets. Sanders is technically an independent in Congress, but he’s long caucused with Democrats in Washington, first as a House member and later in the Senate. He’s been hinting at a presidential campaign for months, and will reportedly make it official with a relatively low-key announcement on Thursday, followed by a bigger kickoff event a few weeks later. Sanders’ campaign for the Democratic nomination is, to put in generously, a long shot. He’ll start his campaign trailing Clinton by roughly 55 points in averages of national polls compiled by Real Clear Politics and the Huffington Post. He’s currently fairing more or less the same in most of the early nominating states, such as Iowa and South Carolina. The one halfway notable exception is New Hampshire, which neighbors his home state and where the RCP average has him behind by a a smaller (but-still-massive) margin of 40 points. Of course, Sanders’ bid is more about providing a progressive counterweight in the Democratic primary than it is about actually upsetting Clinton. And in that regard, the party’s left wing will be hard pressed to find a more progressive candidate than a man who proudly describes himself as a democratic socialist. He’s expected to make income equality, campaign finance reform, and climate change key pillars of his campaign. Clinton has suggested she will do the same, but Sanders’ presence on the trail will give the former secretary of state more of an incentive to do so.